We are delighted to launch our Education project Songs without Borders aimed at KS3 students in languages and/or music. Phase 1 of Songs without Borders is a collaboration with the University of Birmingham School and Elizabeth Stafford of Music Education Solutions to deliver our first ever songwriting workshops in Spring 2018. We worked with three groups from Years 7, 8, and 9, on the Baudelaire poem ‘A une Malabaraise‘ (To a Malabar woman) exploring lots of ideas about lyrics, types of music, and singing in more than one language. Our first ever group of student songwriters have produced their very own songs – based on Baudelaire’s poem. They learnt from Exsangue‘s own track, and developing lyrics in English while still borrowing some of Baudelaire’s French words too. Each song explored a theme from the poem – travel, food, love. Find out more from the Association for Language Learning report. Phase 2 will see a rollout to other schools, via a set of INNOVATIVE ONLINE RESOURCES (watch this space!). 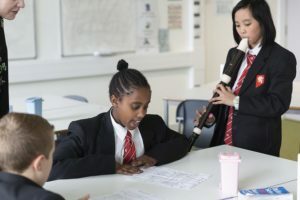 If you are school interested in a combined languages (MFL) and music (songwriting) enrichment project, get in touch with us if you would like to a songwriting collaboration. We will also be releasing a TEACHER EDUCATION PACK later in 2018.